Euronovia is a partner in the following projects. The SOLPART project is a Horizon 2020 project funded under the Energy programme (LCE-02-2015 - Developing the next generation technologies of renewable electricity and heating/cooling). The consortium is coordinated by CNRS and made by a total of 8 partners from 5 different European countries, plus 2 international partners respectively from Morocco and Switzerland. The total cost of the project is 4 558 687€5 (of which 4 366 562€5 is EU contribution). The project runs from 2016-01-01 to 2019-12-31. 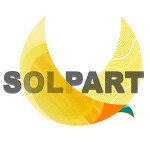 The main objective of the SOLPART project is to develop, at the pilot scale, a high temperature (950°C) 24h/day solar process suitable for particle treatment in energy intensive industries (e.g. cement or lime industries). The project aims at supplying totally or partially the thermal energy requirement for CaCO3 calcination by high temperature solar heat thus reducing the life cycle environmental impacts of the process and increasing the attractiveness of renewable heating technologies. The ORC-PLUS project is a Horizon 2020 project funded under the Energy programme (LCE-03-2014 - Demonstration of renewable electricity and heating/cooling technologies). The consortium is coordinated by ENEA and made by a total of 6 partners from 3 different European countries, plus 1 international partner from Morocco, IRESEN, who are one of the main stakeholders related to Concentrated Solar Power (CSP) in that country. The total cost of the project is 7 297 148€75 (of which 6 339 316€ is EU contribution). The project runs from 2015-05-01 to 2019-05-01. The ORC-PLUS project aims at developing an optimized combination of innovative Thermal Energy Storage (optimized for the CSP scale 1-5 MWe) and engineering solutions necessary to improve the dispatchability (production on demand) and number of hours of production of an existing small CSP plant, located in a desert areas and coupled with an ORC system. The final result will be an industrial pilot plant used to validate the technology in a real operational environment and to demonstrate its feasibility. The Next-CSP project is a Horizon 2020 project funded under the Energy programme (LCE-07-2016 - Developing the next generation technologies of renewable electricity and heating/cooling) to support the development of Concentrated Solar Power. The consortium is coordinated by CNRS and made by a total of 10 partners from different European countries. The total cost of the project is 4 947 420€. The project runs from 2016-10-01 to 2020-09-31. The aim of the project is to improve the reliability and performance of Concentrated Solar Power (CSP) plants through the development and integration of a new technology based on the use of high temperature (800°C) particles as heat transfer fluid and storage medium. To achieve this objective, the project will demonstrate the technology in a relevant environment (TRL5) and at a significant size (4 MWth). ESSIAL is a Horizon 2020 project funded under the Factories of the Future programme (FOF-06-2017 - New product functionalities through advanced surface manufacturing processes for mass production). The consortium is coordinated by ESIEE Amiens - School of Electronics and Electrical Engineering – and includes 13 partners coming from 4 EU countries. This four-year project (November 2017 to October 2021) will receive a 5M€ grant of the European Commission. The project will use laser technologies to develop new generation of electrical steels. ESSIAL pursues 3 main goals: 1. to improve the energy conversion efficiency through soft magnetic circuits; 2. to control and reduce the mechanical vibrations and the acoustic noise; and 3. to ease the deposition / removal of insulation in respect to the eco-design criteria. POLYPHEM is a Horizon 2020 project funded under the Energy programme (LCE-07-2016-2017 - Developing the next generation technologies of renewable electricity and heating/cooling). The consortium is coordinated by CNRS and made by a total of 9 partners from 4 EU member countries. The project runs from April 2018 to March 2020 and will receive a 4,975 M€ EC grant over these 4 years. POLYPHEM aims at improving the flexibility and the performance of small-scale Concentrated Solar Power plants, thanks to a solar-driven micro gas-turbine technology. As a final result, the project will build a 60 kW prototype plant with a 2 MWh thermal storage unit and will validate this innovative power cycle in a relevant environment (TRL 5). SFERA-III is a Horizon 2020 project funded under the Infrastructures programme (INFRAIA-01-2018-2019 : Integrating Activities for Advanced Communities). The consortium is coordinated by CEMIAT (Spain) and gathers 15 partners from 8 European countries and Turkey. The total cost of the project (9,1 M€) is entirely funded by the European Commission. The project started on January 1st, 2019 for a duration of 4 years. SFERA-III (Solar Facilities for the European Research Area) aims at supporting transnational access to Concentrating Solar Power research infrastructures for scientists. This is the 3rd phase of the SFERA project, supported by the EU since FP6. As a partner of the project, Euronovia is in charge of communication, dissemination and exploitation of results activities. ESTEEM3 is a Horizon 2020 project funded under the Infrastructures programme (INFRAIA-01-2018-2019 : Integrating Activities for Advanced Communities). The consortium is coordinated by the Max-Planck Institute. It includes 20 partners from 13 European countries. The total cost is the project is 10 M€, entirely funded by the European Commission. It carries on the work of the FP7-funded project ESTEEM2. ESTEEM3 runs from January 1st, 2019 for a duration of 4 years. ESTEEM3 aims at supporting transnational access for scientists from both academic and private sectors to the most powerful Transmission Electron Microscopy (TEM) facilities in Europe. Euronovia participates in the project as a partner in charge of management, promotion and communication activities. [CLOSED PROJECT] ESTEEM2 is an integrated infrastructure of electron microscopy facilities that gathers 15 laboratories and 3 SMEs with a total budget of more than 10M€. The main aim of ESTEEM2 is to provide access for the academic and industrial research community in the physical sciences to some of the most powerful characterization techniques available at the nano scale. Transnational access to ESTEEM2 centers is obtained through a transparent, simple peer-review process based on merit and scientific priorities. Service to users is supported by a networking programme which addresses key issues such as specimen preparation, data interpretation through theory and simulation, and standardization of protocols and methodologies. A series of schools and workshops provide training in innovative methods in electron microscopy and a forum for discussing emerging and cutting-edge techniques. Directed research programmes focus on the further development of electron diffraction, imaging and spectroscopy as well as the advancement of 3D methods and time resolved experiments. In all, ESTEEM2 establishes a strategic leadership in electron microscopy to guide future developments and promote electron microscopy to the wider research community at large. Euronovia is in charge of the management of the Transnational-Access activity and brings its expertise in the management of EU projects to help the coordinator in the collection and writing of the scientific and financial reports. Euronovia is also involved in the Promotion Work Package. Euronovia is responsible for the constant and consistent management of the ESTEEM2 website and LinkedIn account as well as the publication of articles in general public science magazines. In this WP, Euronovia also helps the ESTEEM consortium in its efforts towards sustainability and integration of Electron Microscopies at the European level.